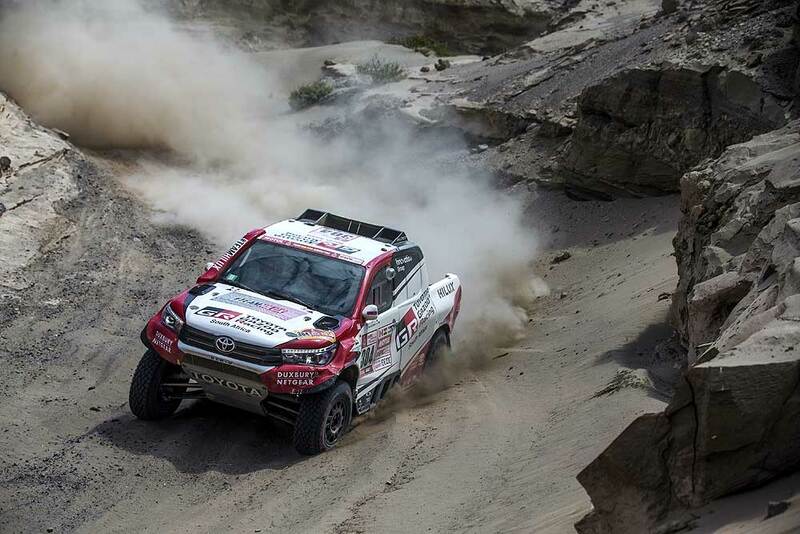 Toyota Gazoo South Africa suffered a setback to its challenge for overall honours at the Dakar Rally when Nasser Al-Attiyah and Giniel de Villiers both lost considerable time on the fourth loop stage through the Peruvian desert around San Juan de Marcona. Al-Attiyah and co-driver Matthieu Baumel began the day 7:43 minutes off the outright lead in their latest generation Toyota Hilux, but two flat tyres and lost time stuck in the sand for more than 20 minutes on two occasions dropped them from third to fourth position. They are now 58:48 mins off the overall lead. "It was a very bad day for us," said Al-Attiyah. "Okay, we are here and we finished but we lost a lot of time. We had two flat tyres and then we pushed hard and then we got stuck twice. The tyres were not the problem, but the time was lost when we got stuck." Giniel de Villiers and Dirk von Zitzewitz slipped to eighth after a pair of flat tyres and long delays in two sand holes cost them over an hour and pushed them down to 17th on the day’s stage. "Everything that could go wrong went wrong today," reported De Villiers after the stage. "All went pretty well until kilometer 120 when we got two punctures within one kilometer. There were a lot more rocks than I expected and I only took two tyres. 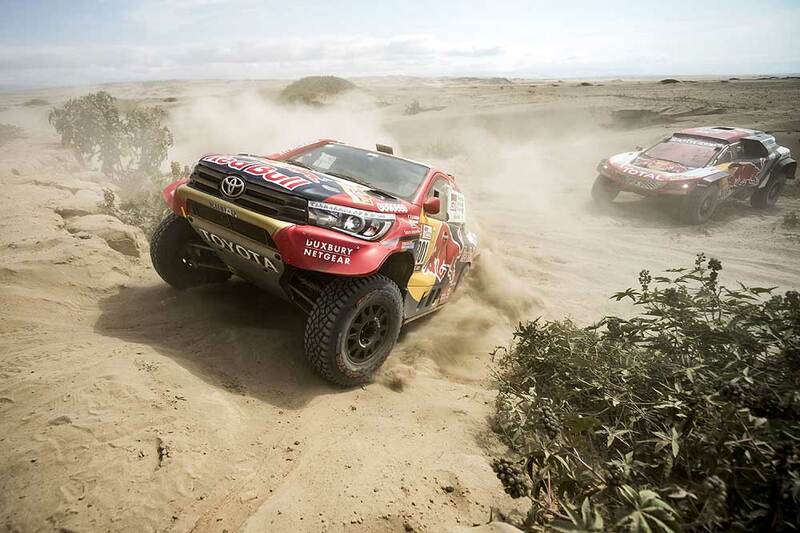 I expected a lot of sand and dunes, which there were, but only after 120 or 130km." "We got the punctures because we were running the pressures a little lower. We cannot inflate and deflate from inside the car like the Peugeots can. So, we had to run low pressures to cross the dunes. The biggest problem was that a tyre came off the rim and then I tried to find a waypoint and got into really soft, bad dunes and fell into a hole." Dutchman Bernhard Ten Brinke and French co-driver Michel Périn brought the third Toyota to the finish in eighth position and now hold fifth in the general classification after their own fair share of problems. "Today was a really difficult stage," said Ten Brinke. "At the beginning, there were a lot of rocks and we had one puncture. After the puncture, we drove slower until we reached the dunes. Before we reached the dunes, we decided to deflate and we stopped. It was a good decision because we passed the dunes easily. Then we were looking for a waypoint. We went too far and had to go back and we almost got stuck two or three times and we decided to deflate again to 1.1 bar. We were looking for the waypoint for 20 or 25 minutes. After that, we decided to put some air in the tyres again and drive safely to the finish. We are happy with the result for today for us. It was my toughest stage ever!"